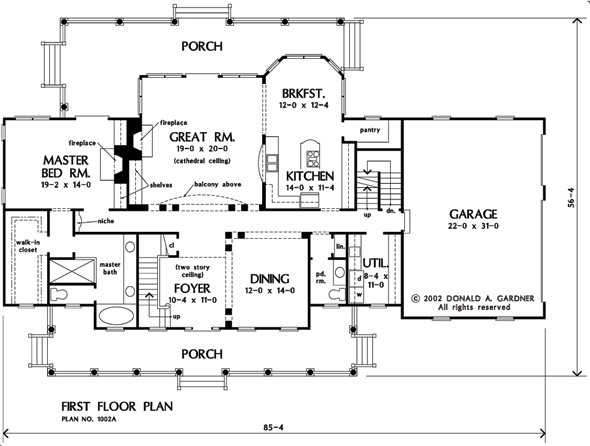 Country charm surrounds a modern floorplan, while porches promote outdoor living. Columns define rooms without enclosing space, and a balcony separates the two-story foyer and great room. Built-ins and fireplaces enhance the great room and master bedroom, and the kitchen features a walk-in pantry and island. Note the bonus room. 1st Floor: 2237 Sq. 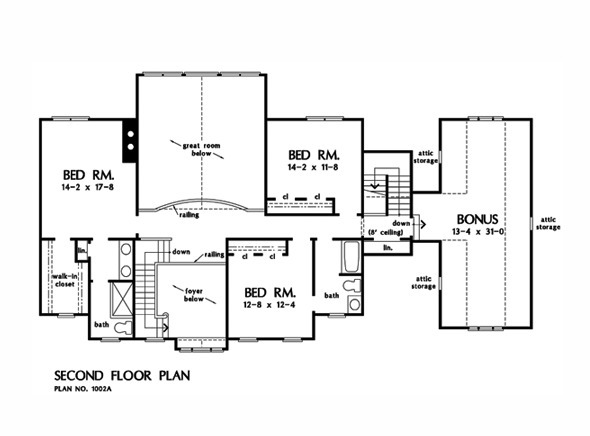 Ft.
2nd Floor: 1182 Sq. Ft. Bonus Room: 475 Sq. 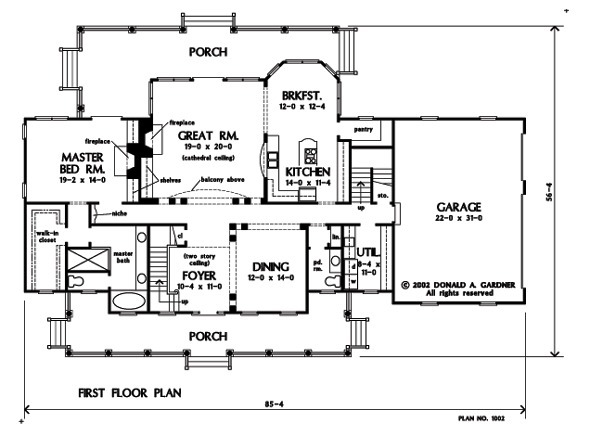 Ft.
House Dimensions: 85' 4" x 56' 4"
Great Room: 19' 0" x 20' 0"
Master Bedroom: 19' 2" x 14' 0"
Foyer : 10' 4" x 11' 0" x 19' 0"
Dining Room : 12' 0" x 14' 0" x 9' 0"
Great Room (Cathedral): 19' 0" x 20' 0" x 22' 3"
Kitchen : 14' 0" x 11' 4" x 9' 0"
Breakfast Room : 12' 0" x 12' 4" x 9' 0"
Utility Room : 8' 4" x 11' 0" x 9' 0"
Bonus Room : 13' 4" x 31' 0" x 9' 0"
Garage : 22' 0" x 31' 0" x 0' 0"
Master Bedroom : 19' 2" x 14' 0" x 9' 0"
Bedroom #2 : 14' 2" x 17' 8" x 9' 0"
Bedroom #3 : 12' 8" x 12' 4" x 9' 0"
Bedroom #4 : 14' 2" x 11' 8" x 9' 0"
Porch - Front : 48' 8" x 7' 4" x 9' 0"
Porch - Rear : 32' 0" x 9' 0" x 9' 0"
Porch - Left : 12' 6" x 6' 8" x 9' 0"
Porch - Right : 12' 8" x 9' 0" x 9' 0"
Other : 7' 4" x 3' 8" x 9' 0"
Other #2 : 7' 4" x 3' 8" x 9' 0"